LASTS LONGER THAN OTHER MOUNTS - The problem with other car phone mounts is they are made of cheap flimsy plastic. Our product has a sturdy suction cup base construction made with thicker and high quality material which means that it won't break when you unmount it. Never suffer broken suction cup and waste your precious money again! SATISFACTION GUARANTEED - Does this come with a money back guarantee? YES! Your purchase comes with a full 90 day no-risk, no-nonsense 100% Money Back Guarantee. Either you’re thrilled, or we don’t want your money! So, what are you waiting for? We have thought everything out, our holder is the best on the market or your money back. Grab 2 or more for a discount and gift to someone close you want to be safe. ONE HANDED CAR PHONE MOUNT - This magnetic cell phone holder for car lets you quickly mount & unmount your magnetic cell phone holder for car with just one hand. 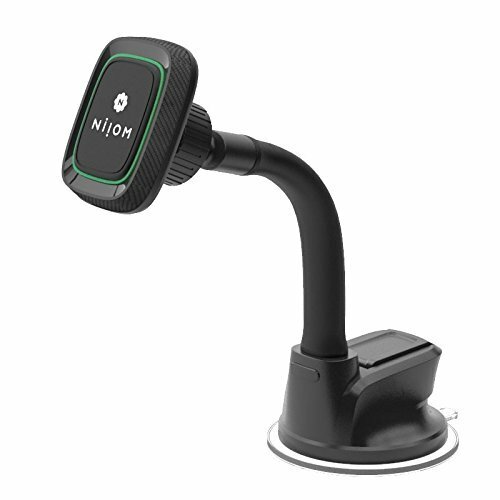 We have read thousands of reviews and complaints on suction cup phone holders to help us design the best car phone mount on the market that is easy to install, one hand adjustable, completely stable, and will never block ports. So, you don't have to spend your precious time looking for the best car phone holder. STRONGEST MAGNETS ON THE MARKET - Our cell phone holder for car uses four powerful N45-grade Neodymium magnets that are stronger than N42-grade magnets commonly used in other cell phone holders on the market. Our strong magnets keep your smartphone securely in place, standing up to almost anything the road throws at you. This is great because you can drive safely with peace of mind and don't have to worry about your phone falling down. View More In Mounts & Stands. If you have any questions about this product by Niiom, contact us by completing and submitting the form below. If you are looking for a specif part number, please include it with your message.